The Brenner Base Tunnel with its access routes in Austria, Italy and Germany is the large project which is the focus of the BrennerCongress. 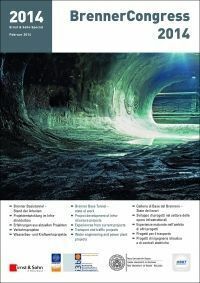 As was the case in recent years, the work done at the BrennerCongress goes much further, as the topics discussed do not only concern the Brenner Base Tunnel but many different issues linked to the desire for effectiveness and efficiency („Do the right thing in the right way“) in the construction industry. One topic, for example, is cooperation at all possible levels: at an international level between Austria, Italy and Germany, at a regional level between Tyrol and Alto Adige, at an organizational level between rail- and roadway engineering, mountain waterway and avalanche protection construction and finally at a technical level between technicians, civil engineers and architects, environmental engineers, sociologists, economists and managers and not least between contracting authorities, businesses and engineering offices. While working to „do the right thing in the right way“, the BrennerCongress attempts to promote cooperation on all these levels. BrennerCongress 2014 will concentrate on project development in infrastructure construction. It is becoming an ever greater challenge to bring an infrastructure construction project to the point where construction can actually begin. This is true especially for large international projects. But even for smaller projects it is increasingly difficult to forge consensus between the people involved in the project and the stakeholders, meaning the people that develop, plan, build and operate the infrastructure and those who use it and/or are impacted in their daily life by the construction or use of it. As in recent years, this issue will be discussed not only from the point of view of a large project but also using the examples of smaller projects. Our work is based on the conviction that cooperation can be obtained by bringing together polar opposites.